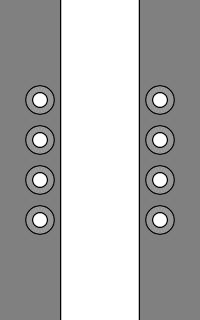 A variation of Double Helix Lacing with inside-out crossovers, transforming it from a low-friction lacing that was fast and easy into a high-friction lacing that 'locks' each row. Sent to me by Matt J. • The right (yellow) end runs diagonally up on the inside and out through the next higher eyelet on the left side. • The left (blue) end runs diagonally up on the outside, tucking under the diagonal segment in the middle to form a 'lock'. • After emerging from the tuck-under, the left (blue) end continues diagonally up on the outside and feeds in through the next higher eyelet on the right side. • Continue up the shoe, at each row the right end running diagonally up on the inside and out the next higher eyelet on the left side, the left end running diagonally up on the outside and in through the next higher eyelet on the right side after a tuck-under in the middle. Repeat until lacing is completed. • On shoes with a narrow spacing between the sides, the tuck-unders will occur over a shorter distance, resulting in more compression and hence more effective locking at each row. • The left and right shoes can be laced in reverse (mirror image) so as to end up with a symmetrical look. 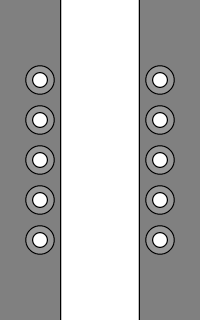 Unlike regular Double Helix Lacing, in which the crossed diagonals are kept apart to reduce friction, this lacing has the outer diagonals tucking under the inner diagonals at each row, which has the complete opposite effect of increasing friction. 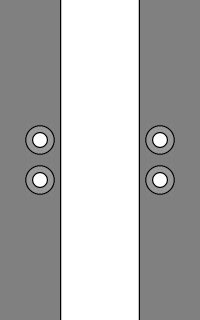 The resulting 'locking' force keeps the lower sections tight while working on the upper sections. This makes it a great lacing for skates, boots, climbing shoes, or any footwear where very firm support is needed. Converse Sweatshirt Hi-tops with Locked Double Helix Lacing. I think it'd be fun to place it right after mine, noting how a small change in pattern can have such a profound effect on functionaity (not only are these harder to tighten/loosen than my method, they're harder than the plain old criss-cross method) -- but I confess I kinda like the way they look! I have a "new" way to lace and IMO its the best. Its basically the double helix lace, except the laces which normally run underneath now loop over the laces which normally run above. It looks really cool and tightens even better than the helix. Original low-friction version that is fast and easy and doesn't 'lock' rows. Monte invented and patented the original Double Helix Lacing method. 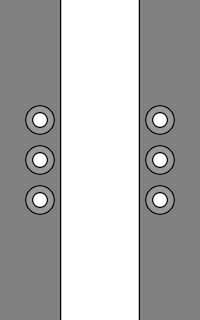 Different method that also 'locks' rows for lacing tightly.